Scars are a natural part of the body’s healing process. Scars are the normal body response to injury. Most wounds, except for very minor ones, result in some degree of scarring. Keloid Scars: These scars are the result of an aggressive healing process. They extend beyond the original injury. Over time, a keloid scar may hamper movement. Keloid scars are common among people with dark skin. Acne Scars: If you’ve had severe acne, you probably have the scars on the face. This can result in psychological and emotional scarring too. Sunken in Scars: This kind of scarring occurs when underlying structures supporting the skin (for example, fat or muscle) are lost. Some surgical scars or acne scars have this appearance. Stretch marks: stretch marks are formed in normal skin due to overstretching or tension in the skin. Scars form when the deep, thick layer of skin is damaged. The body forms new collagen (a naturally occurring protein in the body) to heal thearea, resulting in a scar. The new scar tissue will have a different texture and quality than the surrounding tissue. Scars form after a wound is completely healed. Steroid Injections: Steroid injections into a scar may help flatten it. Injections may help to soften the appearance of keloid or hypertrophic scars. 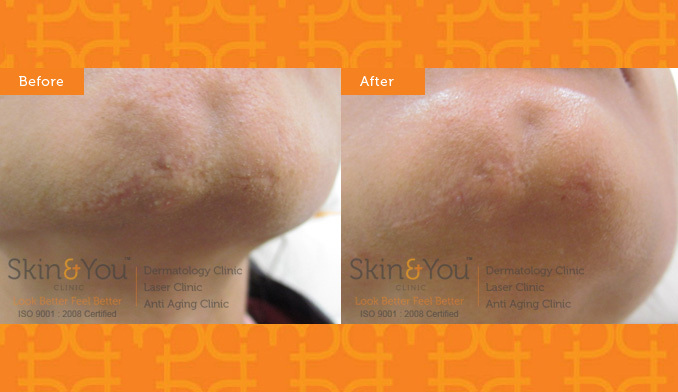 RF PIXEL Laser resurfacing: This procedure resurfaces the skin using different types of lasers. The laser system inch by inch helps in skin resurfacing with minimal or no downtime. Filler Injections: These treatments can be used to raise sunken scars to the level of surrounding skin. The effects of these injections are only temporary, however, and the procedures may need to be regularly repeated. But filler injections can show a dramatic result. MCA Scar Filling Is an advanced technique use to fill the scar by a micro needling method. It helps in collagen regeneration and lifts the scar. Why skin and you for scars? We at skin and you specialise in scar treatments. We have a systematic approach to scars and understand that scars have a physical and emotional effect on the patients.